It's my favorite time in Spring when "Josephine" Clemantis is in bloom. With each passing day another layer of beauty unfolds within each flower. Eventually, right before she leaves, those center clusters will open like the last chorus of a beautiful hymn. The spring quilts have made their way out of storage and are gracing walls and backs of chairs. The colors are so soothing and reflect the garden so well. The Virburnum is a good eight feet tall by my back door. Oh how I love this time of year! 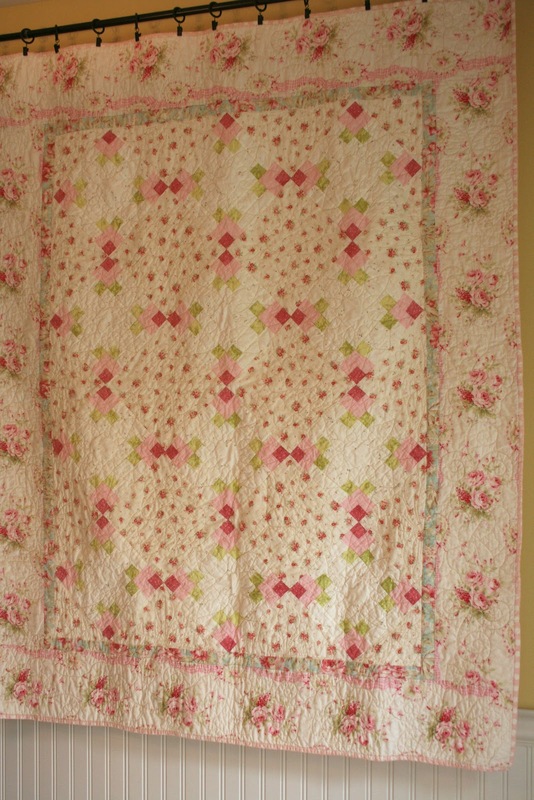 I love the colors and the pattern in your Spring Quilt. Beautiful and so perfect for this time of year. Your flowers are gorgeous Rene. Flowers always share their joy with the world don't they? Your quilt is extra special and pretty too. Hope you are enjoying a beautiful day. Any time of year when flowers are blooming is my favorite! I imagine them singing praises! Such beautiful flowers and gorgeous quilt! Thanks for sharing. My friend Bluebell bought a Josephine clematis for me 3 yrs,. ago . It has lots of buds ready to burst . Near to it a have a David Austin Rose called Napolian . 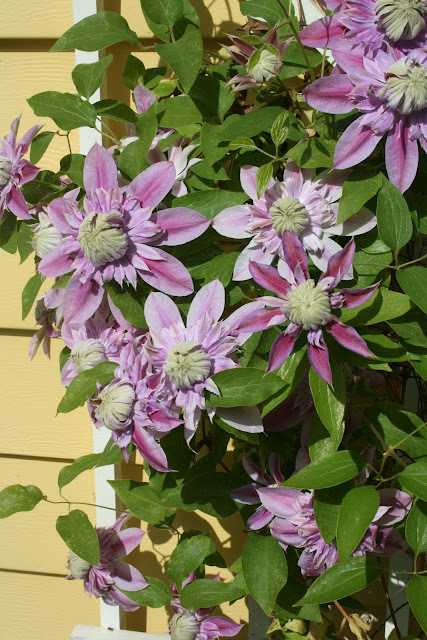 I saw the "Josephine" clematis on another blog this morning and I am amazed at it's beauty. I am definitely going to look for this one! Your quilt is beautiful and looks so "summery". And the viburnum is spectacular. I just love spring, my most favorite time of year! Beautiful! The flowering bushes, and the quilt! I've always loved clematis too. My Mom has a deep purple one. Have a happy day! I too love this time of year but our Clematis is not yet blooming. Oh your quilt is beautiful-I'd love to know the pattern. So light and spring like. 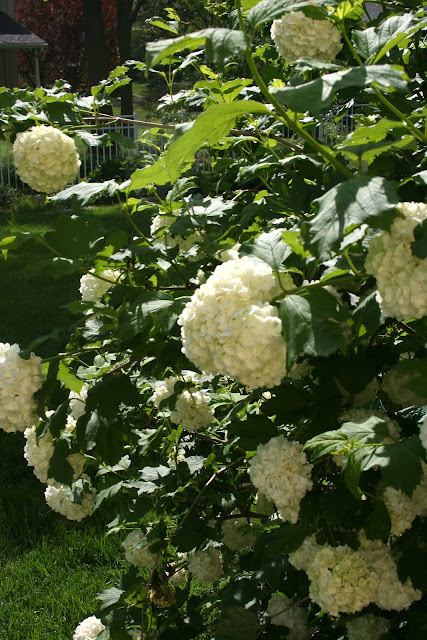 I'm thinking your last flower is a snowball plant? We are still having some frost and cool temps here in Colorado and don't plant much until the very end of the month. Oh, so pretty, Renee. Flowers and quilts for spring.